Stepping into a new world to embark on a brand new adventure is one of the main aspects to a role playing game that catches the attention of gamers. 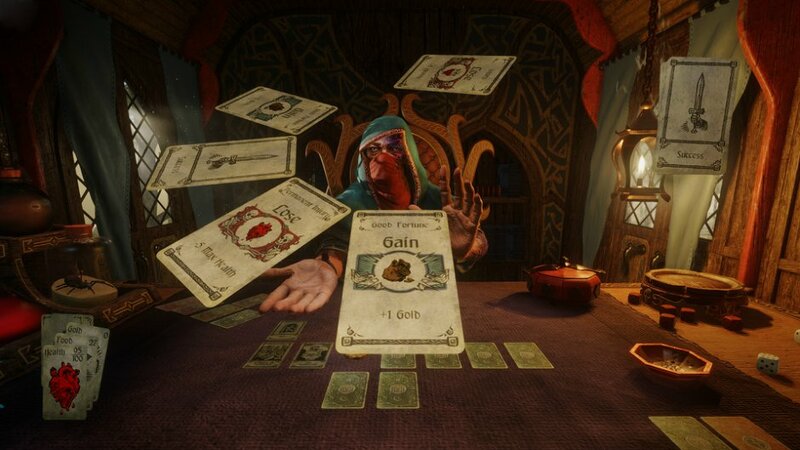 Hand of Fate 2 by Defiant Development has taken this concept and made it merely a step towards the ultimate goal of the game! I can say I enjoyed how there were multiple path lines and short stories that were able to be experienced before reaching the end goal of the games main storyline. With a great enemy ahead, our dealer has created a bountiful set of challenges to be completed before facing his true enemy, Kallas. With the fate of the world surrounding them at stake, it is up to you to grow strong through these challenges and defeat Kallas so that the dealer can once again protect the land from evil. Every challenge will present it's own challenges and story, but they are all forms of preparations for the final fight as you ride in the carriage with the dealer to the greatest foe in the game; Kallas. The mix of challenges presented are various in difficulty and you will never know what to expect to come next, unless you have the right equipment that is. Starting out the game, you are given the challenge titled "The Fool" in which you will first experience the movement style of the game. While the fate card pathway is laid out, you will get to choose which direction to go; up, down, left, or right, no diagonal movements. Each card you land on is known as an Encounter card. An Encounter card can be anything from positive interactions that help you gain health, food, equipment, or gold, to a negative interaction that could take away any of those items. This is where you will find yourself with choices, chances, and challenges to face in order to advance in the best condition you can keep your stats at in order to be able to handle the final fight. But you will have to keep in mind what the current challenges goal is. A challenge could have an end goal as simple as "reach this enemy and defeat him" to a more complicated "obtain six blessings before reaching the High Priestess." While a few of the challenges presented with a main task turn out to be option, but highly suggested, they will not give you full marks upon completion. This is the difference between collecting a gold coin of completion or collecting a silver coin. Before each challenge they give you the chance to pick what will be on the playing field, unlocking new encounters, equipment, and even companions as you advance through the games entirety. This gives you the chance to remove some of the luck this game is based on with knowledge and personal skill. One card I found myself picking for every challenge, so much so that the dealer even started stating that I had a fondness for it, was "The Old Maiden." This is an Encounter card where if you land on it in the field then your options will be to gain health, food, or gold, and this encounter has saved me on more than one occasion! Equipment cards took me a few tries to figure out, but when you select them what you are doing is selecting what items will be for sale at Merchants and at Camp. This is still helpful as you can plan the items that you would like to use in battles and on the card playing field, even if you are unsure at what point of the current challenge you will be able to actually obtain and use it. Companions are more help than they seem to be at first. While, yes they will help you during the battle sequences, they also provide a specific perk of their own. This goes for both the card playing field as well as the battlefield. I found myself choosing Malaclypse the most thanks to his battlefield assistance of providing a shield that will absorb one damaging hit from my enemies and the opportunity to re-choose the card selected from a card wheel, which is based on pure chance most of the time. The battle moments themselves have a very smooth feel to them though and the controls were as comfortable to use as they were easy to learn. Providing a regular hit, a hard hit, block, and evade for your main set of moves, they also give a powered hit that can be earned through consecutive strikes without taking damage. The finishers presented all were rather satisfying thanks to the intensity shown in the final blow to kill the enemy. Whether you used the maul to smash them over the head or the sword to plunge through their chest, it is always great to see a powerful blow as the finale! Everything is pretty well detailed and unmistakable for what it is supposed to represent. I was rather impressed that the graphics within the cart and how the dealer and cards looked just as good as the scenes when you were taken from the card game and brought to battle or obstacle areas. It is all aesthetically appealing, unless you are looking at our dealers face as he looks pretty roughed up from what you can see through his garments. With a soft music always playing in the background, this game gives a sense of relaxation as it challenges you with tough calls and punishing fails. The small noises used for the pendulum test helped with timing the needle to land on it's proper target, while the noises for the card spin was just for ambiance unfortunately. I thought it was a nice touch that if the cards dealt said that I was going into battle somewhere that there is battle all around, such as a town, that you would hear the sounds of battle cries and clashes in the background while the battles that took place in the sewer or outskirts there would be little-to-no background noises around. You don't have to complete every challenge in order to reach the end, so this game easily has a reason to go back through it for those that wish to complete every challenge this game has to offer. Not to mention the perfectionists challenge of collecting all of the gold coins through all the challenges rather than accepting the silver coins you are given when you complete a challenge without full marks. There is also an endless mode that has yet to launch. This will undoubtedly bring more reasons to return to this title to anyone that enjoyed the game as well. I would of liked to have seen some type of difficult card challenge that lead up to the final boss. Skipping over the pathway that led to the finale of all the challenges before taking on Kallas made the fight seem easier as it was. Aside from that, a game based partially on luck should have check points in the middle of challenges so that one wrong choice wouldn't be so devastating that players must start the entire thing over after putting over thirty minutes into that one challenge alone. Hand of Fate 2 is a lot of fun, challenging, and unforgiving all at the same time. While I have lost hours in my play through due to a wrong choice or failed fight and having to restart the challenge, I did not feel that it was completely unfair. Anybody who enjoys a dungeons and dragons style game will enjoy this one as you must make your way through multiple different scenarios and challenges just to reach the end, and no two challenges pose the same threat nor story line. I enjoyed it thoroughly and plan to complete every challenge myself! "It's like playing Dungeons and Dragons with a brutal Dungeon Master!" I am an enthusiast for Horror, PSVR, and Independent games. I also enjoy writing short stories in my spare time and am working with a few Indie Developers as the lead story writer for their games.